US Senator John McCain says he won’t be joining Ukraine’s International Advisory Council as the US constitution forbids it. The board, headed by Georgia’s fugitive ex-leader Mikhail Saakashvili, was created on President Poroshenko’s order. “I was honored to be asked to join Ukraine's International Advisory Council on Reforms, a forum for discussing ways to ensure Ukraine’s territorial integrity and security and support the country’s democratic future in the face of Russian aggression. However, under provisions of the US Constitution concerning the interaction of Members of Congress with foreign governments, I am obligated to decline the invitation,” McCain said in a statement on his website. The hawkish politician added he was “deeply proud to be a friend to Ukraine,” while he said he would also do his best to support the new efforts of the council. 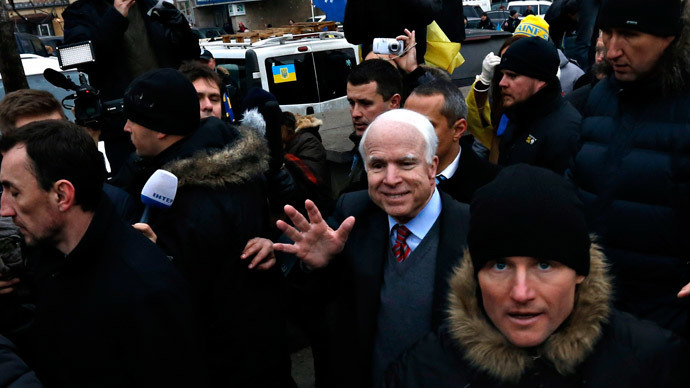 McCain has previously advocated providing Kiev with lethal aid on numerous occasions. Meanwhile, Saakashvili, who is the head of the new advisory group, released a statement on his Facebook page lamenting that McCain would not be joining the council. “John McCain really wanted to join International Advisory Council on Reforms in order to help Ukraine, as we discussed it with him several times during the previous weeks. His considering the idea was quite unprecedented as he is a sitting senator and a leading US politician. “Certainly I am grateful to my longtime friend for making an effort and I am looking forward to working with him even more actively for advancing freedom and countering its enemies,” the exiled ex-president said. The International Advisory Council on Reforms is an advisory body to the Ukrainian President Petro Poroshenko, which is aimed at helping him to conduct reforms. It will also cooperate closely with the National Council of Reforms. The list of members of the advisory group includes mainly current and former European politicians. Among them are the current Chairman of the European Parliament Committee on Foreign Affairs Elmar Brok, Sweden's former Prime Minister Carl Bildt, the former Prime Minister of Slovakia Mikulas Dzurinda, and Lithuania’s former Prime Minister Andrius Kubilius. Poroshenko hopes to use their expertise and experience to help reform Ukrainian’s legislation and also increase the level of investment into the country. In late April, the Economist magazine named Ukraine as having the fastest falling economy of 2015, which has seen its GDP shrink by 6.5 percent in the space of 12 months. On February 13, Poroshenko appointed Saakashvili as head of the International Advisory Council on Reforms. The former Georgian president, who is wanted in his home country on charges including the embezzlement of over $5 million, corruption and brutality against protestors during demonstrations in 2007, will help to represent Ukraine abroad. "We've been thinking for a long time how to use the knowledge, experience and unique know-how of Mikhail Saakashvili in the best way. In Georgia, he managed to implement reforms virtually in all spheres of economic, political and social life. The path we chose the last year with the Revolution of Dignity has been already completed and verified by our neighbors. They are ready to share their experience with us. Until recently, Mikhail was, in fact, a freelance consultant of Ukraine in the issue of reforms. And now, finally, he gets the official status," Poroshenko said in a written statement.